We are engaged in providing Single Disk Floor Scrubber, floor scrubbers, industrial scrubbers and floor scrubber machines which are widely used in public and private buildings. They are simple to use and assure proper cleaning of floor, which in turn improves its look and appearance. Manufactured using quality components and spare parts, these floor scrubbers are in tandem with prevailing quality standards. We facilitate our clients with Disk Floor Scrubber machines, which are used for hard scrubbing and floor maintenance jobs. Known for durability and high performance, these are also utilized for restoration and crystallization of marble floors. 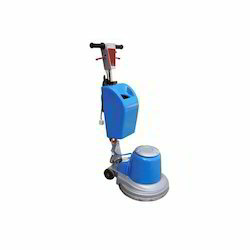 Our range of floor scrubbers comes with comfortable to use and ergonomically designed handle, which increases ease of operation.This can be classified as best floor scrubber or best industrial scrubber. This is the best floor scrubbing machine. 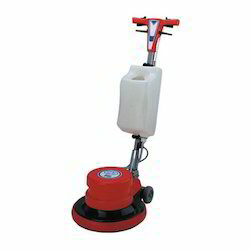 1.5 HP Deck size : 17"
We are offering Single Disk Scrubber, which are used for floor maintenance. 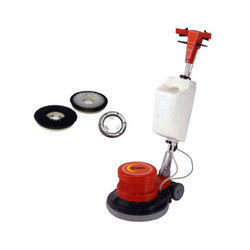 Very durable and high performance and utilize for restoration and crystallization of floor marble floors. 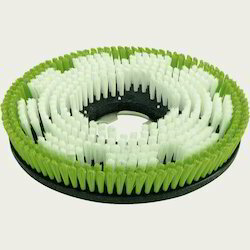 Single disk scrubbers comes with comfortable to use and ergonomically designed handle, which increases ease of operation. Standard Accessories : Handle Water Tank and Soft Brush. 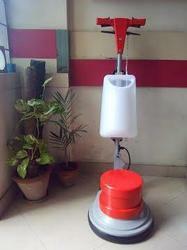 Looking for Single Disk Floor Scrubber ?